Renew Spa is a proud stockist of Environ Skin Care, giving you the freshest, safest, medical grade skincare items with clean ingredients all the way from Cape Town, South Africa. As firm believers in the Vitamin A philosophies of Dr. Des Fernandes, we are always happy to share the latest information and products we receive from Environ and Environ intensive training sessions. 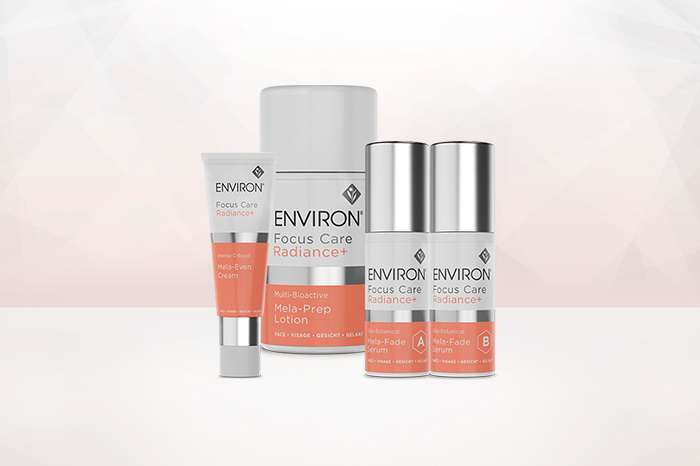 We are soon expecting to receive the newest Environ Focus Care Clarity+ and Focus Care Radiance+ lines, and we can’t wait to introduce your skin to these new products! The new Focus Care Radiance+ products are perfect for those of you who may have been out in the sun a bit too much this summer and are concerned about correcting sun damage and hyper pigmentation. You may be familiar with the Clarifying Lotion and C-Boost that we all know and love for enriching our skin with Vitamins A, C, and D. With the newest Focus Care Radiance+ line, some of these products are getting a new name and package size, while others are getting totally revamped for optimal results. Environ suggests you use the Focus Care Radiance+ line as a three-step routine to accompany your Vitamin Step-Up System to help say goodbye to sun spots and hello to even skin tone. Step 2) Completely new to the Focus Care Radiance+ line is the Vita-Botanical Mela-Fade Serum System, which is a two-product system formulated with a specific combination of vitamins and botanicals. Mela-Fade Serum A and Mela-Fade Serum B must be applied evenly across the skin in equal amounts for best results. Step 3) Previously known as C-Boost, the final step of this routine is Intense C-Boost Mela-Even Cream. Nothing about the formula of C-Boost changed, but you will find it in a new 25 mL package. Follow up with your Vitamin A Moisturizer! Coming soon is exclusive information about the Environ Focus Care Clarity+ line! Stay radiant. « Don’t Forget About Minerals!